Prevention of unnecessary biopsies and overtreatment of indolent disease remains a challenge in the management of prostate cancer. Novel non-invasive tests that can identify clinically significant (intermediate-risk and high-risk) diseases are needed to improve risk stratification and monitoring of prostate cancer patients. Here, we investigated a panel of six DNA methylation biomarkers in urine samples collected post-digital rectal exam from patients undergoing prostate biopsy, for their utility to guide decision making for diagnostic biopsy and early detection of aggressive prostate cancer. We recruited 408 patients in risk categories ranging from benign to low-, intermediate-, and high-risk prostate cancer from three international cohorts. Patients were separated into 2/3 training and 1/3 validation cohorts. Methylation biomarkers were analyzed in post-digital rectal exam urinary sediment DNA by quantitative MethyLight assay and investigated for their association with any or aggressive prostate cancers. We developed a Prostate Cancer Urinary Epigenetic (ProCUrE) assay based on an optimal two-gene (HOXD3 and GSTP1) LASSO model, derived from methylation values in the training cohort, and assessed ProCUrE’s diagnostic and prognostic ability for prostate cancer in both the training and validation cohorts. ProCUrE demonstrated improved prostate cancer diagnosis and identification of patients with clinically significant disease in both the training and validation cohorts. Using three different risk stratification criteria (Gleason score, D’Amico criteria, and CAPRA score), we found that the positive predictive value for ProCUrE was higher (59.4–78%) than prostate specific antigen (PSA) (38.2–72.1%) for all risk category comparisons. ProCUrE also demonstrated additive value to PSA in identifying GS ≥ 7 PCa compared to PSA alone (DeLong’s test p = 0.039), as well as additive value to the PCPT risk calculator for identifying any PCa and GS ≥ 7 PCa (DeLong’s test p = 0.011 and 0.022, respectively). ProCUrE is a promising non-invasive urinary methylation assay for the early detection and prognostication of prostate cancer. ProCUrE has the potential to supplement PSA testing to identify patients with clinically significant prostate cancer. The introduction of circulating prostate specific antigen (PSA) test has increased the rate of diagnosis of prostate cancer (PCa) by as much as 50%. However, the majority of PCa patients diagnosed through PSA screening present with low-risk, localized, Gleason score (GS) 6 tumors. Although PSA has a high negative predictive value (NPV) for PCa, its lack of specificity, limited impact on reducing morbidity, and the harms of over-diagnosing indolent disease have raised concerns about PSA screening . To reduce overtreatment and associated morbidity, the U.S. Preventive Services Task Force (USPSTF) recently recommended against PSA screening to prevent unnecessary biopsies of “clinically insignificant” PCa (CI-PCa) which included patients with benign and low-risk disease . However, following these recommendations, there was a substantial decrease (42.9%)  in the detection of GS ≥ 7 disease, indicating the reduction in PSA screening could delay diagnosis of “clinically significant” PCa (CS-PCa) consisting of intermediate- and high-risk disease. The revised recommendations now include advising men under 70 about the potential benefits and limitations of PSA based screening. However, their impact on the diagnosis of CS-PCa is currently unknown. Several nomograms have been developed to estimate PCa aggressiveness following biopsy, such as the well-established D’Amico criteria  which includes PSA, GS, and clinical T stage. Due to the limited number of variables, patients with the same D’Amico risk category may have vastly different outcomes. Alternatively, the recently developed UCSF-Cancer of the Prostate Risk Assessment (CAPRA) score  is more informative due to ease of calculation and inclusion of key clinical variables including age, PSA, percent of cores positive in biopsy (%core), clinical T stage, and Gleason patterns. There is also the Prostate Cancer Prevention Trial (PCPT) PCa risk calculator , which takes into account ethnicity, family history, PSA, age, and digital rectal exams (DREs) results to calculate the risk of finding any cancer or high-risk (GS ≥ 7) cancer upon biopsy. These nomograms are used to distinguish low-risk versus high-risk PCa patients for management decisions after biopsy. Low-risk PCa patients may be recommended enrollment into an active surveillance (AS) protocol where they are monitored with DREs, PSA tests, multiparametric (mp) MRI where available, and periodic biopsies instead of definitive treatment . Although AS is a preferable management option for patients with CI-PCa, many AS patients with indolent tumors still undergo additional unnecessary biopsies and suffer associated morbidities. Consequently, there is an urgent need to develop non-invasive biomarkers to complement PSA screening for the early identification of aggressive PCa and to guide decision making for initial diagnostic prostate biopsy or repeat biopsies of low-risk patients on AS. To address this, the Movember foundation introduced the Global Action Plan (GAP) 1: Urine biomarker initiative, which brought together 12 research teams from seven different countries. Our study, as part of this initiative, investigated non-invasive DNA methylation biomarkers for improved prognostication of PCa. Aberrant DNA methylation is a hallmark of PCa [7, 8]. Tumor-specific gene methylation alterations are ideal biomarkers due to their stability and ease of detection from patient samples with limited amounts of DNA such as urinary sediments. 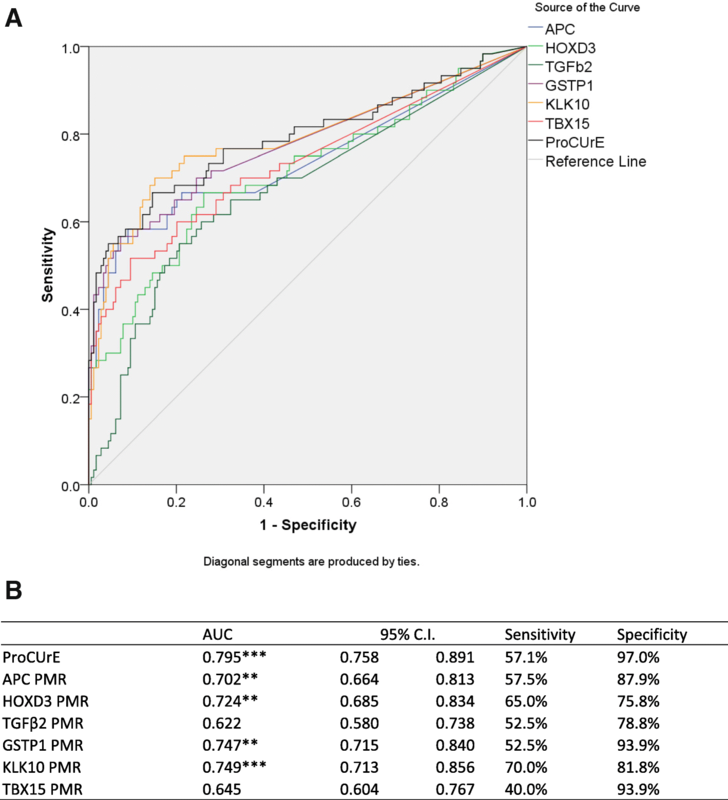 Detection of DNA methylation biomarkers in urine sediment is non-invasive and may be able to supplement PSA screening to identify CS-PCa patients. We have previously discovered and/or characterized tumor-specific DNA methylation of six genes (APC, GSTP1, HOXD3, KLK10, TBX15, and TGFβ2) in radical prostatectomy tumor samples [9–11]. Increased methylation of these genes was found to be associated with higher GS and adverse clinical prognosis. We also examined these biomarkers in post-DRE urine samples from a Canadian AS PCa patient cohort . In the current study, we investigated the utility of these urinary DNA methylation biomarkers for diagnosis and prognostication of CS-PCa in three international patient cohorts. The clinicopathologic characteristics for patient cohorts are summarized in Table 1. To mitigate any inherent biases in patient recruitment, all patients were combined, randomized, and separated into training (2/3 of patients) and validation (1/3 of patients) cohorts [13, 14] (Table 2). Age and PSA were significantly correlated with each other, as well as prostate volume, and %core. (Additional file 1: Table S1, Spearman’s ρ p < 0.01). We assessed DNA methylation of our panel of biomarkers in the urinary sediment of patients recruited. Methylation frequencies (patients with percent methylated of reference (PMR) > 0) ranged from 39.5% (161/408 patients) for GSTP1 to 92.6% (378/408 patients) for HOXD3. PMR distribution for individual markers among benign and PCa patients is shown in Fig. 1. Five of the six gene methylation showed significant increase in PCa compared to benign (Additional file 1: Table S2 Mann Whitney U p < 0.05). Methylation levels of all six genes were significantly correlated with each other (Spearman’s ρ p < 0.01). APC, GSTP1, KLK10, TBX15, and TGFB2 showed significant association with age and %core (Additional file 1: Table S1; Spearman’s ρ p < 0.05). Additionally, GSTP1, KLK10, and TBX15 were associated with PSA (Spearman’s ρ p < 0.05). HOXD3 did not correlate with any clinical variables. To investigate whether combinations of biomarkers were more informative compared to individual markers for detection of any PCa and/or aggressive PCa, we applied least absolute shrinkage and selection operator (LASSO) and constructed an optimal two-gene (HOXD3 and GSTP1) classifier model (ProCUrE) in the training cohort comparing between benign vs CAPRA-HR patients. Receiver operating characteristic (ROC) curve analysis of ProCUrE showed an area under curve (AUC) of 0.795 (bootstrapped 1000 iterations) (Fig. 2), which was higher than any individual marker; thus, we did not analyze individual markers in the validation cohort. An optimal cut-off threshold for ProCUrE was established with the maximum combined sensitivity (57.1%) and specificity (97%). Patients with methylation levels above this threshold are considered positive for ProCUrE status (ProCUrE +ve). To determine ProCUrE’s value for PCa diagnosis, we tested its association with PCa. ProCUrE +ve status was significantly associated with PCa positive biopsies in both the training (Additional file 2: Figure S1A) and validation cohorts (Fig. 3a) (χ2 p < 0.01) while age-adjusted PSA (see definition in the “Material and methods” section) [15, 16] was not (Fig. 3a; χ2 p > 0.05). ProCUrE status identified 31.6% PCa patients with 11.9% false positive cases, while age-adjusted PSA detected 75.3% PCa patients but also had a high number (69.5%) of false positives. The positive predictive value (PPV) for ProCUrE was higher than for age-adjusted PSA (78.1% vs 59.8%) (Table 3A). These results demonstrate that ProCUrE +ve patients are more likely to harbor PCa. To investigate ProCUrE’s value for PCa prognostication, we assessed the ability of individual markers, ProCUrE, and clinical variables to differentiate CI-PCa and CS-PCa patients as determined by GS. Using univariable logistic regression analysis, ProCUrE, PSA, and age showed significant association with CS-PCa. Due to the difference in range of each variable, interquartile range odds ratios (IQR OR) were estimated. The IQR OR of ProCUrE in the validation cohort (OR = 1.58, 95% CI = 1.28–1.96) were of similar size to PSA (OR = 1.98, 95% CI = 1.46–2.68), and age (OR = 1.66, 95% CI = 1.13–2.45) for CS-PCa (Table 4A). Multivariable logistic regression of significant variables age, PSA, and ProCUrE showed that ProCUrE was an independently significant variable for CS-PCa in the validation cohort (Table 4B). These results show that ProCUrE is a robust prognosticator of CS-PCa. We examined ProCUrE among patients stratified into different risk categories based on GS, D’Amico criteria and CAPRA score. χ2 analysis showed that both ProCUrE and age-adjusted PSA could differentiate between patients harboring no disease and/or CI-PCa versus CS-PCa in both the training cohort (Additional file 2: Figure S1B–D) and validation cohort (Fig. 3b–d) (χ2 p < 0.05). ProCUrE was able to differentiate low-risk vs intermediate- and high-risk PCa patients based on GS and CAPRA score, but not D’Amico criteria (Fig. 3b–d). Furthermore, ProCUrE’s prognostic value was consistently more robust as demonstrated by a more stringent p value (χ2 p < 0.01) compared to age-adjusted PSA (χ2 p < 0.05) in the validation cohort. ProCUrE exhibited higher PPV than age-adjusted PSA for several different prognostic assessments (PPV: 76% vs 70.5% for CAPRA, 76% vs 72.1% for D’Amico, and 76% vs 63.9% for GS risk, Table 3B–D) indicating its overall robust ability to identify CS-PCa. Additionally, we found that ProCUrE significantly differentiated high-grade PCa, including GS ≥ 7(4 + 3), and GS ≥ 8 from all other patients, with higher PPV (37.5% and 31.3%, respectively) compared to age-adjusted PSA (24.5% and 16.7%, respectively) (Fig. 3, Table 3B–D). These results indicate that patients who are ProCUrE +ve have a higher likelihood of harboring CS-PCa and high-grade (GS ≥ 8) tumors. To determine whether ProCUrE could add discriminatory value to PSA testing, we performed concordance statistics (c-statistic) analysis of PSA alone and ProCUrE with PSA combined in the training cohort using logistic regression. The c-statistic with PSA and ProCUrE combined (0.775) is significantly improved over PSA alone (0.729) (DeLong test p = 0.039), indicating that ProCUrE has additional discriminatory value to PSA for detecting CS-PCa (Table 5). Only GS risk was analyzed since CAPRA score and D’Amico criteria is calculated using PSA. To determine whether ProCUrE could add additional value to current clinical nomograms, we used the PCPT risk calculator for risk assessment in a subset of 144 patients (out of 408 patients in total) that had family history, ethnicity, and DRE results available. We assessed the diagnostic (detection of any PCa) and prognostic (detection of GS ≥ 7 PCa) value of PCPT (AUC = 0.741; 0.771, respectively) and ProCUrE (AUC = 0.746; 0.730, respectively) individually. Further, using c-statistic, we calculated the additive value of ProCUrE to PCPT for diagnosis of PCa using logistic regression, which increased from c = 0.741 for PCPT alone to c = 0.817 for PCPT with ProCUrE. Similarly, for the detection of CS-PCa (as determined by GS) addition of ProCUrE to PCPT increased from c = 0.771 to c = 0.822. Both values represent a significant increase (DeLong’s test p = 0.011 for diagnostic, p = 0.022 for prognostic value) and indicate that the information provided by ProCUrE could further improve current PCPT parameters for prognosticating PCa patients prior to biopsy. Our study developed a urinary DNA methylation biomarker-based actionable assay, ProCUrE, to identify CS-PCa that would warrant treatment. ProCUrE significantly improves risk stratification with a higher PPV compared to age-adjusted PSA. Patients who are positive for ProCUrE will be more likely to harbor aggressive tumors and thus ProCUrE has the potential to supplement PSA or other tests that focus on NPV. Importantly, ProCUrE has additive value to PSA assessment and to PCPT risk calculator for the detection of aggressive (GS ≥ 7) cancers. PSA testing cannot reliably distinguish patients that have CS-PCa disease from those that do not require treatment. Therefore, invasive confirmation biopsy is necessary for PCa diagnosis and prognostication. A non-invasive adjunct test to PSA, such as ProCUrE, that can identify patients with CS-PCa would reduce overtreatment and prevent morbidity associated with unnecessary biopsies. ProCUrE is comprised of the promoter methylation of HOXD3 and GSTP1 genes. HOXD3 is a member of the homeobox gene family of transcription factors which play important roles in morphogenesis and cell adhesion [17, 18], while GSTP1 is a member of the GST family of metabolic enzymes which function in regulation of cell cycle, DNA repair, and apoptosis . Increased methylation levels of HOXD3 and GSTP1 are observed in prostate tumors and are correlated with aggressive PCa and/or adverse clinical outcomes [9, 18, 20, 21]. GSTP1 methylation has been previously investigated in urine sediments and was found to be PCa specific when compared to benign patients . In a recent study of urinary methylation biomarkers, APC and GSTP1 methylation in conjunction with clinical variables demonstrated 100% NPV for distinguishing GS ≥ 7 PCa . Although this study demonstrated that urine-based DNA methylation markers could be used to prognosticate PCa aggressiveness, their results showed a high (26%) false positive rate compared to only 13.8% false positive rate observed for ProCUrE. Thus, their combined panel of APC and GSTP1 is less than favorable to address the current challenges for managing PCa, specifically, to minimize overtreatment of low-risk patients. Currently available non-invasive tests for PCa diagnosis and prognosis include the Prostate Health Index , SelectMDx , mpMRI , and PCA3. Similar to ProCUrE, SelectMDx is a post-DRE urine-based, two-gene (HOXC6 and DLX1) expression assay that can detect CS-PCa (GS > 6) (AUC = 0.77). The Prostate Health Index (PHI)  is a FDA-approved blood test that measures total, free and -2proPSA with greater specificity than free and total PSA for CS-PCa . MpMRI has a high NPV (95%) for GS ≥ 7 tumors . However, high cost and limited availability remain a limitation for implementing mpMRI as a screening tool. The Progensa PCA3 test is the only FDA approved urine-based test for PCa diagnosis. With its high NPV for PCa (90%) , PCA3 can prevent unnecessary repeat biopsies. The Mi-Prostate score combines PCA3 and TMPRSS2:ERG fusion with the multivariable Prostate Cancer Prevention Trial risk calculator (PCPT) for prediction of PCa (AUC = 0.762) and high-risk PCa (AUC = 0.779) which is comparable to our ProCUrE assay in the training cohort (AUC = 0.795 for benign vs high-risk PCa, Fig. 2)  Additionally, we demonstrated that ProCUrE, when combined with PCPT, has even greater AUCs for diagnosis (0.817) and prognostication (0.822) of PCa than the Mi-Prostate score. However, it should be noted that this comparison was calculated on a subset of the total number of patients that had DRE, family history, and ethnicity information available. All of the aforementioned tests are promising for PCa diagnosis or prognostication. However, all of these tests focus on NPV for PCa or high-risk PCa. Patients who are above the selected thresholds for these tests remain uncertain with respect to their disease status. Working in conjunction with the above tests or PSA, our ProCUrE assay fulfills a niche by focusing on PPV to offer a distinct advantage in identifying PCa patients with clinically significant tumors. Thus, patients who cannot be ruled out as having indolent tumors could be tested with ProCUrE to assess whether they have aggressive disease. ProCUrE could also be combined with tests such as SelectMDx to build a more comprehensive multivariable urine test in the future. This will improve current clinical PCa patient management once validated in independent studies. Our study has certain limitations, including the fact that patient cohorts recruited for our study had differences in size and composition (e.g., UEA cohort had patients with higher PSA, GS, T stage compared to other cohorts) and as such, they could not be analyzed as three independent cohorts, despite using consensus recruitment criteria. 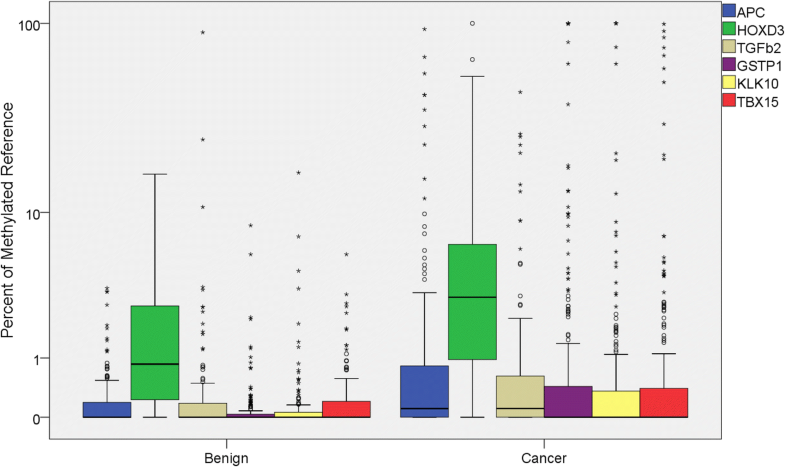 Histopathological-based cancer diagnosis of biopsies was performed at three different participating centers which may have contributed to some variation in Gleason grading between cohorts. However, our strategy of combining patients from all three cohorts and subsequently randomizing into training and validation cohorts, overcomes these caveats as it ensured that the training and validation sets would include patients representing a broad spectrum of prostate status, from benign with low PSA to very high risk PCa. 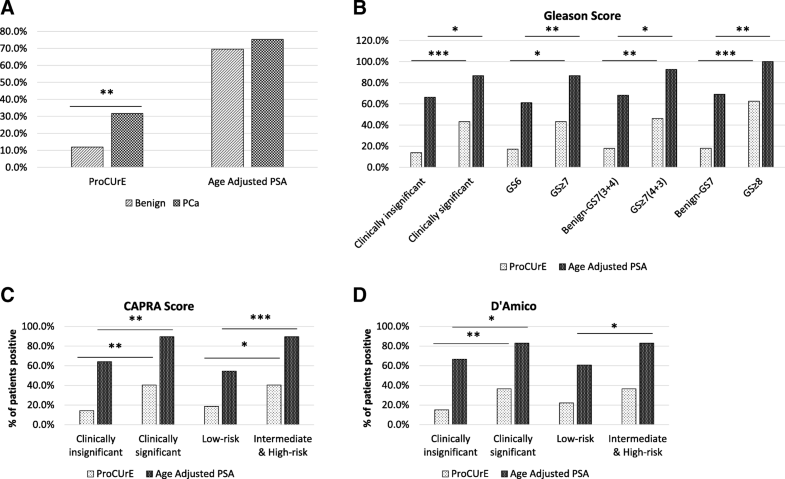 Other potential caveats are that benign patients with abnormalities such as high PSA may have contributed to the lack of significance for age-adjusted PSA with PCa diagnosis. Patients who are false positive for ProCUrE +ve status may actually harbor occult tumors. In this regard, follow-up data collection is ongoing for future biopsies and/or MRIs, which will enable assessment of ProCUrE for prediction and confirmation of CS-PCa. Additionally, clinical stage information for the UEA and Dublin cohorts did not differentiate T2a, T2b, and T2c tumors. Therefore, D’Amico criteria was calculated with all T2 patients assigned as intermediate risk. This may have contributed to the lack of significance for ProCUrE to stratify patients based on D’Amico criteria. In previously published studies, we described a 4-gene methylation Classifier Panel (APC, GSTP1, CRIP3, HOXD8) in PCa patients monitored by active surveillance (AS) for the prediction of risk-reclassification [12, 31]. We were unable to screen two genes (CRIP3 and HOXD8) from this four-gene classifier panel in the current study due to limitations of DNA samples availability. Similar to our findings in the AS PCa patient cohort, we found that methylation frequencies of APC and GSTP1 in urinary sediment were lower compared to those reported in tissue samples. Lastly, it is difficult to assess the additive value of ProCUrE to PSA for identifying patients based on the CAPRA score and D’Amico criteria, since both nomograms are calculated using PSA leading to strong association with PSA with these risk groups. Both CAPRA and D’Amico criteria are limited in that they require prostate biopsy to calculate risk. ProCUrE is advantageous in this regard since risk assessment can be performed prior to biopsy. A non-invasive urine-based assay that can distinguish PCa patients with aggressive, clinically significant disease from those with benign and/or low risk disease would be valuable in reducing morbidity associated with over-diagnosis and preventing under-diagnosis of patients that would benefit from definitive treatment. Our ProCUrE assay could be used to supplement PSA screening and monitoring so those with aggressive disease would be identified early and those without will avoid unnecessary treatment. Participants were prospectively recruited between April 2012 and September 2015, from the University of East Anglia/Norfolk and Norwich University Hospital, UK (UEA cohort, n = 194), the University Health Network, Canada (UHN cohort, n = 155), and Trinity College, Ireland (Dublin cohort, n = 59), together as part of the Movember GAP1 Multi-Center Urine Biomarker (MoGAP-MUB) cohort. Patients underwent prostate TRUS biopsy due to increased PSA and/or abnormal DRE (PSA follow-up time 0–122 months). Benign patients with normal age-adjusted PSA were recruited due to symptoms of BPH or had microhematuria detectable on dipstick only (i.e., not gross hematuria). Less than 10% (39/408) patients had prior biopsies, all other patients were recruited at initial biopsy. Post-DRE first catch urine samples were either collected prior to biopsy or at least 1-month post-biopsy. Samples were mostly collected within 12 months from the date of biopsy. There were two patients that had > 12-month difference between biopsy and sample collection (range 14–146 months) and three patients with unknown biopsy dates. The patient with sample collected 146 months post-biopsy and all patients with unknown biopsy dates were benign patients. Informed consent was obtained following protocols approved by the research ethics boards of all centers and Sinai Health System, Toronto, Canada. Benign indicates patients with negative biopsy. GS: low risk (GS ≤ 6), intermediate risk (GS7), and high risk (GS ≥ 8). D’Amico criteria: low risk (GS ≤ 6 and T1–T2a and PSA < 10 ng/mL), intermediate risk (GS7 or T2b or PSA 10–20 ng/mL), and high risk (GS ≥ or > or PSA > 20 ng/mL) . The CAPRA score is defined as the sum of the following variables: age at diagnosis (< 50 = 0, ≥ 50 = 1), PSA at diagnosis(ng/mL) (≤ 6 = 0, 6.1–10 = 1, 10.1–20 = 2, 20.1–30 = 3, > 30 = 4), biopsy Gleason pattern (no pattern ≥ 4 = 0, secondary pattern ≥ 4 = 1, primary pattern ≥ 4 = 3), clinical T stage (T1 or T2 = 0, ≥ T3 = 1; %core: < 34% = 0, ≥ 34% = 1) . CAPRA risk categories are as follows: low risk (0–2 points), intermediate risk [3–5], and high risk (≥ 6). PCPT risk was calculated using the Cleveland Clinic Risk Calculator Library – PCPT Risk Calculator v2.0 . Up to 50 mL of first catch urine was collected from each patient following DRE and centrifuged at 1200×g for 5 min. Urine sediments were separated from supernatant and resuspended in 1 ml of PBS and stored at − 80 °C. Urinary sediment DNA was extracted using the AllPrep DNA/RNA mini-kit (Qiagen Inc.) Bisulfite conversion was as previously described . Multiplex MethyLight, a methylation-specific qPCR assay was used to determine the methylation levels of APC, GSTP1, HOXD3, KLK10, TBX15, and TGFβ2 . ALU-C4 (ALU) was used as a methylation-independent, sodium bisulfite conversion-dependent internal input DNA control. Primer/probe concentrations, cycling parameters, and data acquisition/analysis were as previously described, using Applied Biosystems 7500 (Life Technologies) . Gene methylation was scored as percent methylated of reference (PMR) according to Eads et al. CpGenome Universal Methylated DNA (EMD Millipore) was used as the positive control and to generate standard curves. Quality control criteria included genes of interest (GOIs) standard curve R2 > 0.95, ALU R2 > 0.99, and slope range from − 3.28 to − 4.86. Any sample with a higher cycling threshold (lower quantity) for ALU than the least concentrated standard curve point for which all GOI amplified was excluded from analysis. Samples were analyzed in duplicate and were reanalyzed if replicates had a difference in PMR of > 10%. Data development and analysis were carried out in accordance with the Minimum Information for Publication of Quantitative real-time PCR Experiments (MIQE) guideline . where the intercept is − 0.8395549, the coefficient for HOXD3 is 0.1397128, and the coefficient for GSTP1 is 0.8632709. Additional comparisons (benign vs PCa, CI vs CS-PCa as determined by GS, CAPRA and D’Amico) were performed in the training cohort (Additional file 2: Figure S2). However, none of these comparisons yielded a model with as robust discriminative value (higher AUC) as observed with benign vs CAPRA-HR comparison. Therefore, we opted for the model constructed using benign vs CAPRA-HR for further analysis. Spearman’s ρ rank was used to compare PMR, age, %core, prostate volume (cc), and PSA at diagnosis. ROC curve analysis was used to determine ProCUrE’s sensitivity and specificity at every cut-off value. The value with the highest sum of sensitivity and specificity was chosen as the optimized threshold. The same numerical values derived from the training cohort were used in the validation cohort: threshold derived from ROC analysis (threshold value = 0.574264899821094) and intercept and coefficients derived from generalized linear modeling. χ2 tests were used to determine any significant association with overall cancer status or CS-PCa (≥ intermediate-risk cancer as determined by GS, CAPRA, or D’Amico criteria). Univariable and multivariable logistic regression was performed to estimate odds ratios and corresponding 95% confidence intervals to assess the ability of individual markers, ProCUrE, and clinical variables to identify CS-PCa patients using the lrm function of the “rms” R package (5.1–2). C-statistic was calculated using ROC curves . DeLong’s test  was used to compare significance for c-statistic as part of the roc.test function of the pROC R package (v1.13.0). LASSO analysis was carried out using the “glmnet” function of the “glmnet” R package (v2.0-13)  to determine the optimal value of the penalty coefficient lambda, with 10-fold cross-validation performed using the “cv.glmnet” function. Optimal lambda was chosen as the cross-validated lambda at the minimum binomial deviance. Model assessment was performed using the “ROCR” R package, AUC was determined via bootstrapping with 1000 iterations. For all described methods, two-sided p values of < 0.05 were considered significant. All tests were conducted with IBM SPSS software (SPSS Inc. Released 2014. PASW Statistics for Windows, Version 22.0) or R version 3.4.0 . Reporting recommendations for tumor marker prognostic studies (REMARK) guidelines were followed in analysis . We would like to acknowledge the Movember Urine Biomarker Consortium which brought together 12 research teams from seven different countries to collaborate on such an important project. A list of members is provided below. Colin Cooper, Jeremy Clark, Schools of Medicine and Biological Sciences, University of East Anglia: Norwich, Norfolk. NR4 7TJ, UK. Bharati Bapat, Lunenfeld-Tanenbaum Research Institute, Sinai Health Systems, University of Toronto, Toronto, Ontario, M5T 3L9, Canada. Rob Bristow, Ontario Cancer Institute, Princess Margaret Hospital, Toronto, Ontario, Canada. Chris Parker, Royal Marsden Hospital, Downs Road, Sutton, SM2 5PT, UK. Ian Mills, Queen’s University Belfast. School of Medicine, Dentistry and Biomedical Sciences. Institute for Health Sciences, Belfast, UK. Hardev Pandha, University of Surrey: Guildford, Surrey, GU2 7XH. UK. Hayley Whitaker, Molecular Diagnostics and Therapeutics Group, Cruciform Building, University College London, Gower Street. WC1E 6BT. UK. Mireia Olivan, Andreas Doll, Vall d’Hebron Research Institute and Hospital and Autonomous University of Barcelona: 08035 Barcelona, Spain. Hing Leung, The Beatson Institute for Cancer Research, Joseph Black Building, University of Glasgow, Glasgow, G12 8QQ, UK. Antoinette Perry, Cancer Biology and Therapeutics Laboratory, School of Biomolecular and Biomedical Science, Conway Institute, University College Dublin, Dublin 4, Ireland. Martin Sanda, Department of Urology, Winship Cancer Institute, Emory University School of Medicine, Atlanta, GA, USA. We gratefully acknowledge the patients from three international centers who participated in this study. We also acknowledge assistance of staff at The UHN Genito-Urinary BioBank (GUBioBank) (Toronto). The UHN GUBioBank is a REB approved investigator-initiated bio-banking program that collects and archives biological specimens and data obtained from consenting urologic oncology patients. The purpose of the program is to facilitate the discovery and validation of novel biomarkers, which ultimately will enable advances in the area of personalized medicine in Urology. This work was supported by grant funding from Movember (GAP1 Urine Biomarker Award), Prostate Cancer Canada No. 2011-700, Movember PCC TAG No. 2014-01 (B. Bapat), The Ontario Student Opportunity Trust Funds Award (F. Zhao, S. Kamdar, R. Jeyapala), and Ontario Graduate Scholarships (F. Zhao, E. Olkhov-Mitsel, S. Kamdar). BB, JC, and NF contributed to the conception and design. FZ, EO-M, JG, NF, JC, RH, MH, RM, AP, AT, EO’R, and SK took part in the acquisition of the data. FZ, EO-M, SK, RJ, DB, and BB were responsible for the analysis and interpretation of the data. FZ and BB drafted the manuscript. BB, EO-M, CC, DB, and JC did the critical revision of the manuscript for important intellectual content. FZ, EO-M, SK, and DB contributed to the statistical analysis. BB and CC obtained the funding. BB, DB, JC, NF, and AP gave administrative, technical, or material support. BB did the supervision. All authors read and approved the final manuscript. Informed consent was obtained following protocols approved by the research ethics boards of all centers and Sinai Health System, Toronto, Canada. Informed consent was obtained from all participants at all centers. Force USPST. Final recommendation statement: prostate cancer. Screening. 2012; [updated November 2013. Available from: https://www.uspreventiveservicestaskforce.org/Page/Name/second-annual-report-to-congress-on-high-priority-evidence-gaps-for-clinical-preventive-services. Surgeons TBAoU. PSA MEASUREMENTS Frequently-Asked Questions [Available from: http://www.tsft.nhs.uk/media/45224/PSA_levels.pdf. Accessed 15 Oct 2018. TR Core Team. R: A language and environment for statistical computing. R Foundation for Statistical Computing, Vienna, Austria. 2014. http://www.R-project.org/.